This is for those who want to be graded, or for those who are just generally keen on learning. This lesson took FOREVER to write because I needed to write out each example over and over again, apologies for the long wait! And look at the first position - The Ionian (Major) Scale. And look at the first one again. This should cover close to all of the requirements for the official grading from companies, but each year supplies new targets and expectations, so keep that in mind. 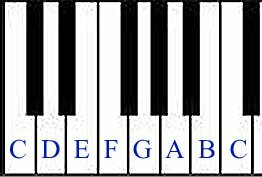 We're all familiar with the notes A - G, but just incase, in Music we refer to our musical notes from seven letters in the alphabet, these are repeated and they represent the same notes at a higher/lower level. 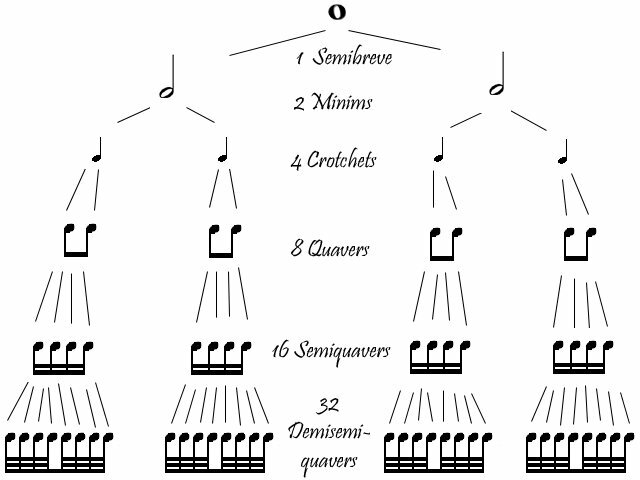 The Octave (eight) is the term for the same note, higher or lower containing the same letter name. E.G. A-A, D#-D#, etc. These notes are placed on the Stave. The Stave consists of a series of five parallel lines. Notes can be placed on the lines or in the spaces between them. The lines and spaces are always reckoned from the lowest upwards. All of these notes can have no certain pitch or name until some distinguishing mark is placed at the beginning of the stave. 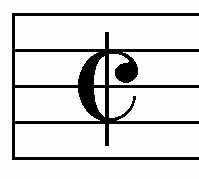 The mark is called a Clef (which translated means "Key") and the clef then lets you know what notes are what on the Stave. The Treble Clef, which was originally a capital G, circles round the second line and fixes that line as G, so any note on that line represents the note G. Originally the Treble clef was known as G clef. Now because this clef is placed here, we are now able to define what the pitch is. So now that we've seen these notes, there's one note that's missing from both of these clefs, that's "Middle C". It's called middle C because it's the note which is nearest to the middle of the piano. It's written on a line bolow the Treble and a line above the Bass. All of these notes I've just shown you can be shown on all of the white keys on a piano. The smallest distance between two notes on the keyboard is called a semitone. There are semitones in the picture above; C-C#, C#-D, E-F, etc. A Tone consists of two semitones; C-D, E-F#, G#-A#, etc. 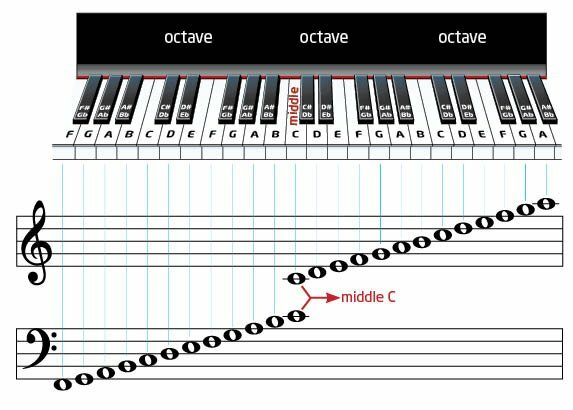 I'm sure most of us know what a scale is, but for those who don't: A scale is a group of notes which can be ascending or descending from the starting note. It depends on the key to determine what scale is going to be used. Think of it like a position where you keep your hand still and each finger is tied to that individual fret. So the 7th fret's notes will always be played with the first finger, the 8th fret's notes will always be played with the middle finger, 9th the ring finger, and 10th with the little finger. On this site, as I hope you already know, the low E is always the bottom string and the high E is always the top string. Now on notation, these eight notes can be divided into two groups, each have four notes. This is known as a Tetrachord. Which is the Greek term; tetra meaning four, chorde meaning string or note. So as you can see, the two semitones are in the same place, and between all other notes the interval is a tone. But in order to preserve the correct order of tones and semitones, the distance between the third and fourth notes of the second tetrachord should be a semitone, not a tone. So for us to correct this notated piece, we need to put a sharp (#) before the F to raise it a semitone. Therefore, in every major scale, except C Major, there's at least one note which will need to be sharpened or flattened whenever it occurs, this is necessary for us to preserve the correct order of tones and semitones. So any sharps or flats occurring in the course of a piece other than in the key-signature are called accidentals. The Tonic is the key note, the root note. The tonic triad in a major key is a chord of three notes, consisting of the tonic, third and fifth of the scale (doh-me-soh). The length of sounds is shown by notes of different shapes, which I mentioned near the beginning of the lesson. Periods of silence are shown by signs called Rests. This is 4 times as long as a Semibreve. The reason why the four of these are no longer used in modern times is because they're too slow and fast for modern music, which is why it died out around the romantic era. When we listen to music, usually we can feel a place where we can usually clap. This is called the Pulse or Beat of the music. If you listen closely to some songs in music, some beats can be stronger than others, and those are called Accents. The beats almost always fall into a regular group of two or three, the first of each group being an accent. The number of beats from one accent to the other splits the music into equal measures, each of which is called a Bar. In order for us to know where these splits are, a line is placed across the stave, which is called a Bar-line. This tune will therefore be in two time. This will be in three time. At the end of a piece of music, or a section of a piece, two bar-lines are placed across the stave. It's called a Double Bar. The time of a piece of music is shown by the Time-Signature, and this is ALWAYS placed immediately after the key-signature at the beginning of the piece. So by looking at these time-signatures, you can see that the numbers are placed one above the other. For now, it's best to think of the top number as showing how many beats there are in a bar, and the bottom number as the value of each beat. So, 2/4 indicates that there are two crotchet beats in each bar. Similarly 3/2 means that there will be three minim beats in each bar. So, in the two examples I mentioned a little bit before, 2/4 indicates that there will be two crotchet beats in each bar, and 3/2 indicates that there will be three minim beats in each bar. 3/8 means three quaver beats in a bar. 3/4 means three crotchet beats in a bar. 4/4 means four crotchet beats in a bar. 2/2 means two minim beats in a bar. 4/4 time is also known as Common Time especially in old music, and instead of figures (4/4) it's shown by the sign "C". Here's where I should point out that C is not a capital letter for Common Time. In early days music in three time was represented by O, the circle or symbol of perfection; music in two or four time by C, the imperfect or incomplete circle. The value of a note or rest can be increased by placing a dot after it. The effect of the dot is to increase the length of the note or rest by half its original value. is equal to the value of 3 quavers. is equal to the value of 3 semiquavers. 1) By a Tie or Bind. = a crotchet plus a quaver. The first note only is sounded, but it's held on for its own length plus that of the following tied note. The effect of the first dot is to increase the value of the note by half, and the second dot adds again half the value of the first dot. 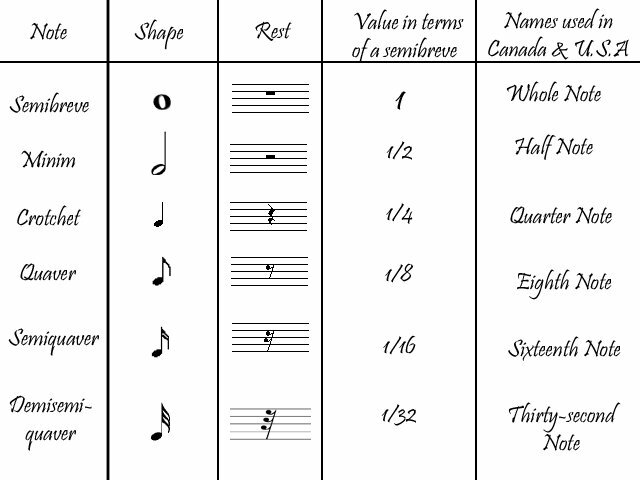 Here's a table showing simple time signatures, which are ordinary notes like minim, crotchet, etc. The rest will be explained later on. Note, these are all the same tempo; 120 BPM (beats per minute). Hopefully it'll make more sense now. The last sharp is always the seventh degree of the scale, so the key-note will be a semitone above. The last sharp in order in the above tune is C sharp; therefore the key-note (a semitone above) will be D, and the key D Major, because of the presence of F sharp in the tune. But, if a passage only has flats (there's only one flat key in this grade) the key-note will be four notes below this flat. The flat is B flat, therefore the key will be F Major. A tune does not necessarily begin or end on the key-note. The second last tune (D Major example) does neither. The last tune ends on the key-note, but doesn't begin on it. Make sure you keep that in mind at all times! As time goes on, this will be easier to remember, but for now, just keep recapping everything I've covered. Good Luck! Awesome lesson Jazz! This is so much better than what I was working on. I think by creating my lesson I learned more than it would have helped anyone else. In truth, I learned how much I did'nt know! I'm glad you like it! It took ages to write out and think of examples, but it'll really benefit everyone who's interested. Fantastic!!!!!!!!!!!!!!!!! Finally theory I can understand. Thank you very much Jazzy. This lesson is custom made for me. I acutally understand it, and that's saying alot. Thanks a lot! I'm glad you like it! Still, if you don't understand anything, I'm here to answer any questions. Damn dude. Very impressive. Great introductory lesson on theory. Does this site have anything about building chords and triads yet? Seems like that's a big gaping hole in a lot of people's theory to bridge this classical stuff to modern music. As always, excellent lesson Jazz. Reminds of the first semster of music I took in school. wow, Jazz that is an awesome lesson. You really took some time in making this. It goes to show how much of an asset you are to this forum and community. Can't wait to see Grade 2!!!! Thanks a lot guys! I appreciate such a compliment Tele! Grade 2 has been started, just going to be a while before it's completed, hope you don't mind waiting! The Grade 2 terms will be up soon, probably by the end of today. for music n help us to build same. lesson is great n the way u have put it down makes really easy to understand n learn. Under Sharps, Flats and Naturals You mistake a G for a D.
I just want to say how great it is to have this much information in one place. I'm sure this will help a lot of people, and its extremely cool of you, JazzMaverick, to take the time to post this. I just wish this was around when I was learning this stuff lol. I wish I coulda got my hands on this 25 years ago. Great explanations. I can't believe I made such a mistake - thanks Nullnaught for pointing that out. I'll sort that out as soon as I can. hey,jazzy quik question. how do you know exactly which note to play on a stave?like say i just had a staff with just one G note on it.which string would i play that gnote on? that comes with knowledge of the other notes around it and knowung what octave to play in, I could explain it better i f you want. You can pm me anytime. @ G shred, where middle C is on a stave, that would be played on the B string, 1st fret. - Transpose how you will. But that's where it's originally played. I hope you can sork it out from there? uumm kinda not really,oh well i guess ill stick with tabs. What if you have that middle C and a C two octaves above it in the same chord? @ Gshred, that's disapointing that you'd give up so easily man. Depends if you want music to be your profession or not - but if you really want something, you should know you have to put in the effort to learn it. Sadly there is never an easy route. You would then transpose it around the fretboard. So, play it on the G string, a few frets away and you have the exact same middle C.
This is something that's very important for every guitarist to understand. A lot of people are talking about this so I'll try and write a lesson to make it easier for everyone. Hang on a sec, why are you asking me Nullnaught? You told Gshred a few posts up that you knew how it worked and you were going to PM him about it. Busted! hahaha. yes i did. . You shouldnt state a way to do something like its the only way to do it. You'll have exceptions to the rule. Thats all. Is there a way to post standard notation. It would be cool if we had licks in standard to practice with. But i just dont see how to do it without posting pictures. We should have standard notation exersizes too somewhere here mabey..
jazzy,I normally wouldnt give up.so easily,but for.right now i have other pressing matters to attend to,i cna.read music and understand which notes to play just not where to playem.maybe ill give it another crack when i have time to really sit down and study. The best thing to do would be to get a music program that focuses on musical notation, write it up that way and paste it into your lesson, topic, lick, and carry on that way. It's the same with Tab, but Tab technically isn't music to begin with, it's just a temporary easy way out of the real stuff... but it can't last, because tab is so very limiting compared to notation. In truth, most people will not be motivated enough when just simply reading something - what you need is a real teacher, in front of you to show you what's right and what isn't. It's the only way you can be easily pointed out on your mistakes without the risk of waiting around, doing what's wrong and finding out months later via websites that you've actually been doing it wrong the whole time. Teachers are a much better way to learn. The lessons that are on here are just something to help guide you, but a teacher is a much better choice. 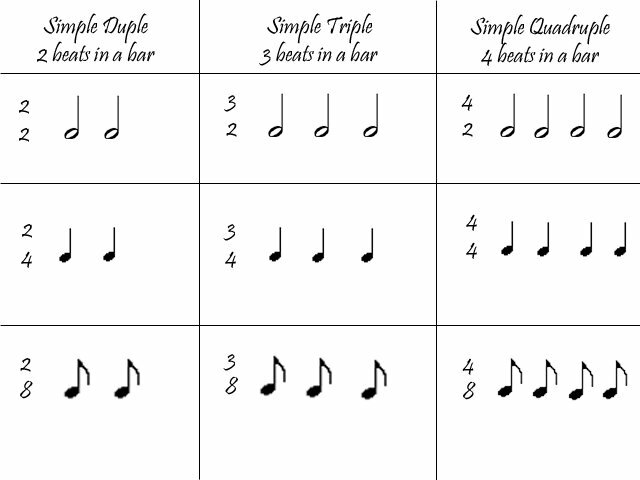 3/8 is typically considered a one beat measure (6/8 is a 2 beat measure; 9/8 a 3 beat; 12/8 a 4 beat; so on and so forth) but if you're doing a rhythm based on pulse (5/16 would be a great example of a rhythm based on pule) then 3/8 is a 3 beat measure as you have all ready described.